Research shows that 15-20% of teens self harm. Brain scans of teens who cut or self-harm are likely to show early structural changes in the brain that are correlated to mental health disorders in adults. Thankfully teenage brains are resilient, and with early intervention, attention, and care many can recover completely. Historically, Self harm has had a reputation of being an “attention-seeking behavior,” but brain science is now showing that for many teens, self-harm is an early warning sign of physical changes occurring in the brain. 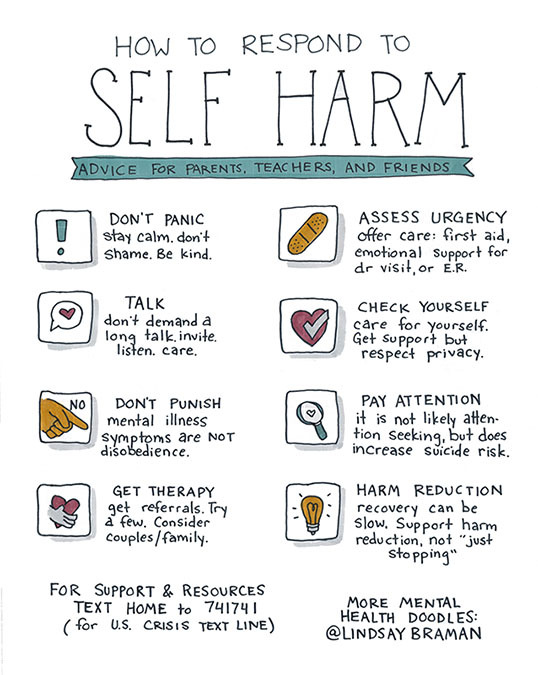 Kids and teens who self harm DO need attention and support to access early interventions to help them recover and thrive. I wanted to create this handout for teams, parents, and anyone in relationship with someone who is self-harming. This post is written with teens as the focus, but self-harm can and does occur throughout the lifespan are requires supportive, empathic care at all life stages. With this piece, I wanted to explore some of the misconceptions about how we engage teens who self harm. Stay calm. Don’t shame. Be kind. The natural response to discovering something as shocking and scary is your teen self harming is to feel upset and emotional. It’s okay to feel upset, it’s okay to tell your teen you are upset, but try to avoid letting your teen see you panic. If you panic, you are likely to inadvertently put your self-harming teen into the role of providing care for you, and that can be confusing for a hurting teen (and potentially can create a cycle in which self harm reoccurs). If you feel like you cannot handle your emotions in the situation, it’s okay to assess the situation and (if there is no immediate danger) step out and take a moment to breathe. You might say “You aren’t in trouble but I’m really concerned. I want to talk with you about this, but I need a moment to process” this not only delays the conversation until you are in a space where you can actually engage, but sets an example for self care in tough situations. Whether you have discovered someone harming themselves or have had someone disclose their self-harm to you, offering care is the first concern. Is an ER visit warranted? Even if the wounds are very superficial, you should offer care in the form of first-aid if the person will accept it. The process of cleaning and bandaging someone’s self-harm wounds is a way to provide very tangible care to that individual. It says, louder than words, “I’m here. I care. I’m not turning away from you.” That care, even if “unnecessary” shows the individual that they deserve care and that you are available to give it – two factors that might reduce self-harm episodes in the future. Although you may want to wait until the initial shock wears off, don’t avoid talking about self-harm. The more of the topic is avoided, the more it is implicitly shamed, and the more likely it is that the shame of silence will fuel future, covert episodes of self-harm. Don’t demand a long talk, especially with teens, but invite the conversation to happen. When it does, listen to the individual’s experience and avoid the temptation to fix. You may want to talk with your teen about how to communicate around the issue. Let them know they can tell you about episodes of harm without judgment. See #7 and #8 for strategies to reduce the frequency. Being a good parent, caregiver, or friend to someone who is self-harming requires that you take good care of yourself. Seeking support around this issue can be tricky, as teens can rightfully feel like their privacy has been violated if a parent speaks too freely to others about their issue. Show discernment in who you choose to confide in for support, and identify one or two people who can support you through the experience. If you need more support don’t hesitate to seek therapy yourself so you can be a better support to your teen. Mental health struggles cannot be remedied through discipline. First, seek to understand. Process why it’s happening, practice harm reduction, and review alternate behaviors. Then and only then, with the support of the therapist, collaborate with your teen on how consequences for continued self-harm episodes might help support them making choices that keep them safe. Download a high-resolution printable PDF for 99 cents. 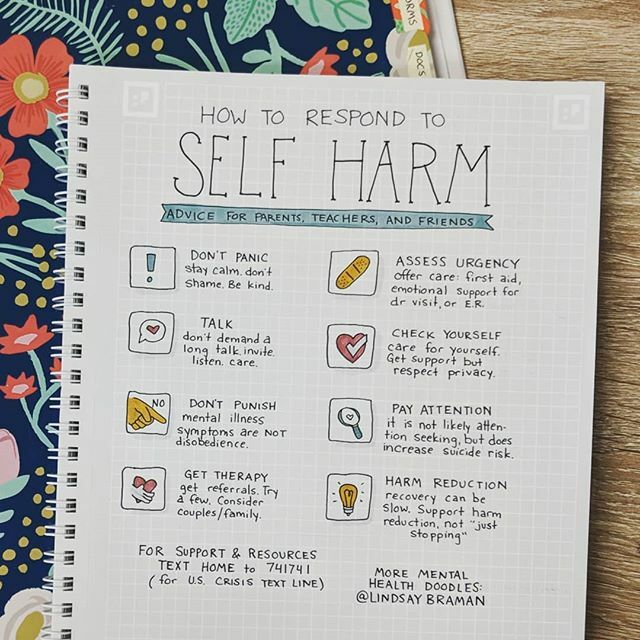 The majority of teens who self harm indicate doing so brings relief- a clue to the changes in the brain that researchers are discovering among teens who cut. Self-injury is the second strongest predictor of suicide (the number one predictor of death from suicide being a previous suicide attempt). What if they are doing it for attention? Some of us were raised in families that normalized ignoring behavior when we suspect someone is “doing something to attention,” but here’s the thing: all behavior is communication, and if we ignore that communication we risk losing that person’s trust. Next time you think someone is doing something for attention, think about the role the behavior is serving. What might it be saying? How might it be an attempt to access the resources the person needs in order to function? If your teen is cutting or self-harming, it’s time for therapy. Do not wait to see if it gets better. Find a good therapist by asking a doctor, teacher, or guidance counselor for referrals. Not every therapist is a good fit for every team. Even if your pediatrician who has never steered you wrong swears a particular therapist is a miracle worker, they might not be a good fit in personality or approach for your teen. So while it’s okay to require your teen to show up to therapy, don’t make them continue to visit a therapist they don’t like. Instead, ask them to commit to three sessions with a therapist, and if they still dislike the therapist, try three sessions with a new therapist, etc. Consider family therapy. Self harm in the family is disruptive and often the most natural responses (panic, punishment, etc) from loving parents can inadvertently perpetuate the cycle of self harm. Lean on professionals to help guide you through this tough season of parenting. Kids and teens are often distressed by their acting out because they don’t know why they are doing it. The role of the therapist is often one of interpreting for the family: helping kids and parents understand what’s really happening, so the family can work with the underlying challenges instead of the behavior. This reduces anxiety for child and parents, gives the kids a voice to communicate what they need to, and often resolves or reduces the problem behavior. Harm reduction is kind of new to mainstream mental health. Essentially, we are starting to realize that even though abstaining from a harmful behavior, substance, etc would be best, it’s often not a realistic expectation. An example of harm reduction might be making list with your team of less harmful ways to “self-harm” (an example might be snapping a rubber band on their wrist, or squeezing an ice cube) and then agreeing that before the next time they cut they will try one to two things from the list. 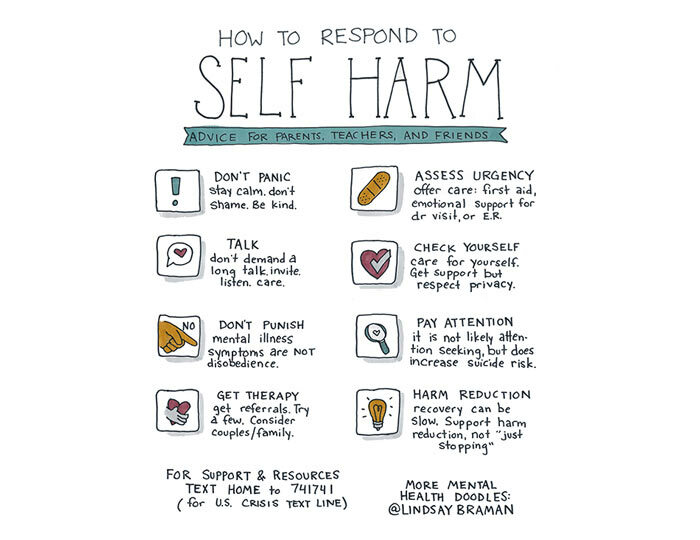 Self harm recovery can be slow and non-linear, especially if the behavior has become a habit. Work with your teen and your therapist to develop ways to support recovery. Want to share this as a printable with clients, students, or parents you work with? You can print this article or download a high-resolution PDF version of this handout. Options for download include: 1. A one-time download of this PDF for 99¢ or 2. Support continued development of mental health related doodles and access my entire catalog of printables for $5/mo via Patreon.